The Tibetan word "Thangka" refers to the flat cloth on which paintings are produced and by extension to the images and paintings themselves. The Tibetan art of Thangka painting is at once a folk, traditional, and sacred art: folk because it is an expression of what is essential to the Tibetan people's culture, aspirations, and principles of living; traditional because it is taught, studied, practiced, and produced according to an established, precisely transmitted body of craft and contemplative knowledge which is, in turn, a vehicle for the essence of Tibetan Buddhism; and sacred because its form and content make of this phenomenal world a manifest "bridge" to, or expression of, the inconceivable, primordial, ultimate Reality, from which (as the Tibetan Buddhist tradition teaches) "all dharmas" arise and return. The visual dimension of Tibetan Buddhism, as presented in Thangka painting, is integral to the tradition as a whole both as a support to, and complementary expression of, the oral, text, and experiential dimensions. Like other forms of sacred and traditional art, it allows truths and realities that are formless, or otherwise too subtle and profound for conceptual thought, to be 'seen' and visualized in such a way that they may be realized contemplatively. 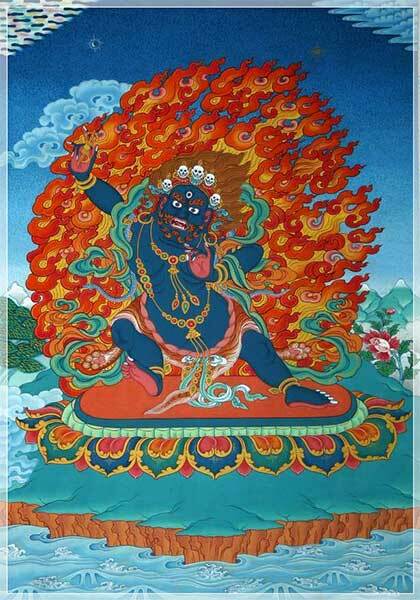 It is the practice and transmission of this traditional art of Thangka painting that Kumar Lama has made his lifelong devotion, vocation, and profession. Along with painting Thangka and teaching, Kumar Lama is working to develop a more personal expression of the tradition, a style entirely grounded in and informed by the craft, art, and vision of Thangka, but which he uses to present non-Thangka themes and content. He calls these works "Scenes From The Pure Land". "The Pure Land" is wherever all phenomena, all dharmas, all appearances, are seen in a non-dual vision of reality. This is a vision in which all is innately sacred, without duality, and therefore without distinction or opposition between so-called "sacred" and "secular" as they are customarily conceived. As a meeting-place between the traditional and the non-traditional, these paintings express a primordially pure view of everyday life and contemporary realities. Kumar Lama's comprehensive training and his art are the convergence and unified expression of the total tradition of Thangka painting. In Kumar Lama's art, this unified expression has been developed to a rare degree of presentation in which the distinction between the traditional and the personal disappears in their non-dual mirroring of one another.